Ta książka to przede wszystkim przełożenie sportu na język fizyki i matematyki. Autor tłumaczy jakie prawa fizyki oddziaływują na ludzkie ciało w czasie biegu, gry w piłkę czy skoków do wody. Mimo użycia wielu wzorów matematycznych udaje się zachować dosyć prosty język i jasny tok rozumowania. 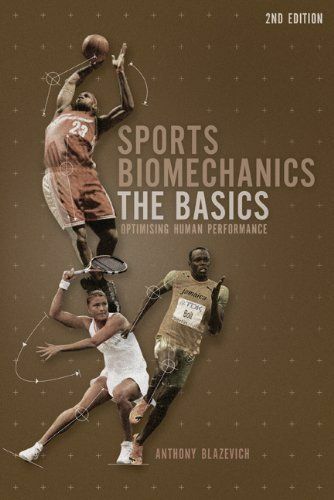 For coaches, athletes and students of biomechanics, Sports Biomechanics: the basics answers real-world questions in sports using easily comprehensible language and clear and concise diagrams. Each chapter is devoted to answering questions in a single area of sports biomechanics with the scientific underpinnings of sports performance clearly explained. Biomechanics is simply the science of 'mechanics', a particular section of physics, as it relates to the human body. In the sport sciences, biomechanists do just about everything, including improving aerodynamics of vehicles, improving swim stroke technique to maximize swimming propulsion, and optimizing running technique to increase running speed or efficiency. It is a core subject on all sports science courses, and undergraduates must complete this module in their first (and often second) year. Because of the use of math and physics to explain biomechanical concepts, students often find it difficult to grasp the basic elements of biomechanics. Anthony Blazevich’s book is designed to explain to students the key concepts of biomechanics, using clear examples, tying all theory to practical examples to help students relate the biomechanics principles to improving in their coaching and performing.